As much as I loved our night visit to the Alhambra, I’m glad we were able to go back and experience the Palacios Nazaries during the day as well. 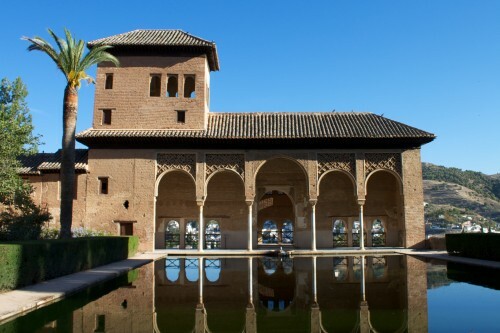 As I mentioned in my planning post, we purchased tickets for the morning visit to the Alhambra, with an 8:30 entrance to the Palacios Nazaries. It was early, but definitely worth it to beat the heat and the crowds. I would highly recommend an early morning visit (no later than 9:30 would be my preference). 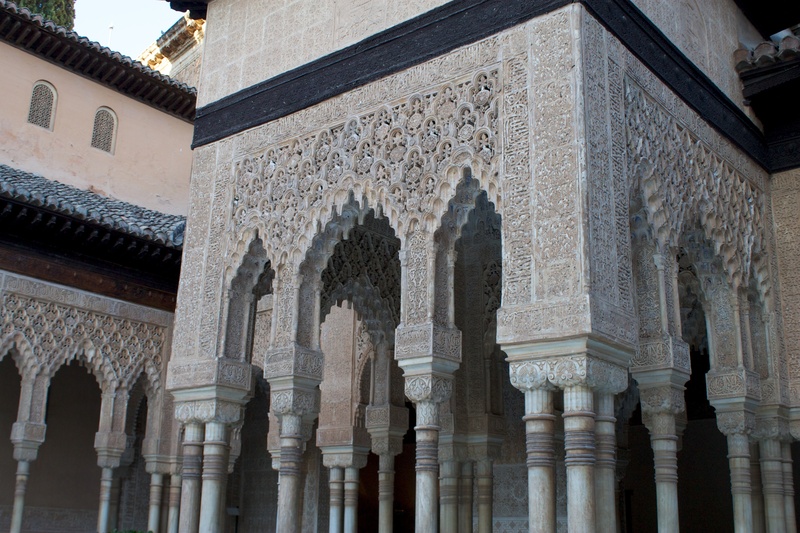 Even with the early entrance, there were a couple of tour groups, and it’s hard to enjoy the beautiful Moorish details and the relaxing courtyards with large groups of talking tourists. Since the 8:30 entrance time is the first available spot, it’s your best bet for enjoying the Palacios Nazaries without the extra noise and people. We arrived about 15 minutes early, and there were about 15-20 people in line ahead of us. However, unlike other time slots, the 8:30 slot allows no possibility of hundreds of tourists already roaming around the palace, clogging up the passageways and courtyards. We were amongst the first people in for the day. And, better yet, since we had already seen the palace at night, we skipped the very first room (which can get congested) and essentially had the entire place to ourselves (we did end up going back to the first room to take a look at the detailed walls in the daylight, but it was so extremely crowded that we only stayed for a few minutes). The quiet and empty palace gave us room to move about each area to see the details and talk to each other without yelling. As far as a guide for the daytime visit, we decided to try out the audio guide (6 euros) since we had already read the majority of Rick Steves’ site tour. I’m glad we rented the audio guide because it gave some extra information (a lot of it was the same, though), and would recommend it if you don’t have something else to guide you through the palace. The Palacios Nazaries will still be beautiful and amazing without a guide, but learning the use of each room or a story about something that happened in a courtyard really brings the palace to life and helps you appreciate it so much more. Our daytime visit of the Palacios Nazaries lasted about an hour and a half, but had we not been on the night visit, we would have been there for at least two hours to take everything in. While the moonlight and yellowed lights gave a mysterious and magical feel to the palace at night, the Moorish details on the walls and ceilings could be seen much better with the daylight. The visit ended through a garden courtyard, which was closed during the night visit, and we were ready for the next stop on our Alhambra tour. We were very excited to see the Generalife Gardens and the Alcazaba, since neither were open during the night visit. The route through the Palacios Nazaries led us away from the entrance and toward the gardens, so we continued that way and enjoyed the beautiful flowers and trees along the path. It took about 15-20 minutes to get there, but it was a flat walk, and at 10:00, it wasn’t too hot yet. There are a few spots along the way which boasted great views of Granada, so we took a few breaks (as shown in the picture above). The summer house of Charles V is what you pay for with the “Generalife Gardens” – the ticket-collector stands right outside the entrance to the house. However, the most impressive part of the gardens is just before the house – mazes of hedges, beautiful flowers, romantic paths underneath canopies of greenery, and trickling water features. While still older than almost any place I visit on a regular basis, the gardens right before the house were not built until the 20th century. I couldn’t help but feel a bit disappointed by how “new” it was, but we enjoyed the area nonetheless. The expansive gardens allowed us to wander around without bumping into too many other tourist groups. We spent very little time in the actual house. The courtyard was pretty, but felt small and confined after visiting the Palacios Nazaries. The house itself was nothing special – no elaborate decorations and only three rooms. After we had enough of the Generalife Gardens, we made the 15-20 minute trek back to the Alcazaba, which is just a bit further past the entrance of the Palacios Nazaries. Overall we were disappointed by the Alcazaba, but mostly because we were expecting more of an old fort, open for exploring (think Rocca Maggiore, in Asissi, Italy). Instead, it was an old fort with a one way route guiding toursits on a predetermined path, with no room for veering. We were able to get some great views of the city, but it would have been much more fun to roam through the ruins. The entrance (and exit) is right near the entrance to the Palacios Nazaries, so it is worth a visit if you come before your entrance time (assuming it’s not the 8:30 entrance) or you have time afterwards. It doesn’t take long to go through the fort, and there are several pieces of information on the audio guide. And finally, we spent very little time at Charles V’s Palace. 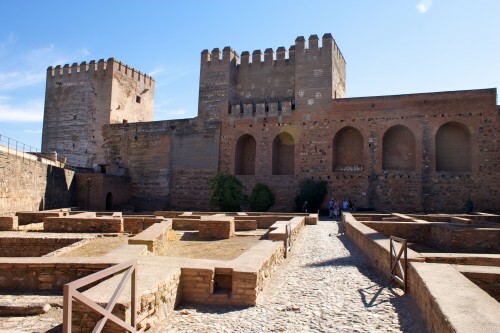 We didn’t have the energy (nor the interest, really) to go into the museum, so we walked around the palace ground and upper floors and then made our way out of the Alhambra, the same way we had entered earlier that morning. This entry was posted in Travel and tagged Alhambra, Granada, Portugal/Spain 2012 Trip, Spain by Kristin. Bookmark the permalink.